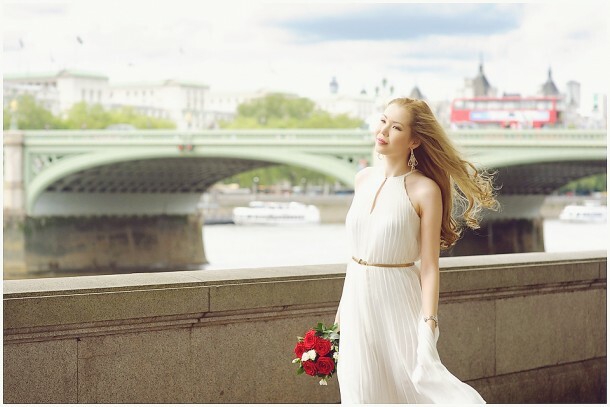 The Olympics are fast approaching the capital, and as the world descends what better time to arrange a pre wedding shoot with iconic London as the backdrop? As with any pre wedding shoot, one of the most important aspects is to get the couple comfortable in front of the camera. Our clients are not professional models and for most this is their first photo shoot. For Kairzhan and Kamila it was no different, but they were almost immediately relaxed and confident enough to deliver amazing results with very little direction. Mention must also be made of Kamila’s dress choice which was particularly flattering and certainly complimented the shoot. Hailing from Kazakhstan, Kairzhan is currently studying for his Masters in Birmingham. His fiancé Kamila has been residing in Paris though, and time together during his studies is precious indeed. Time spent apart did not seem to deter them in enjoying their moment together as we made our way through London town from Westminster to Tower Bridge. As always a picture speaks a thousand words, so I’ll allow these to sing their praises. Craig, you are the best! Thank you so much for these brilliant pics and your professionalism. We really enjoyed that time. Kamila and I want to say you thank you once again! Hope we will invite you for our anniversary in Paris. I love the BW one with the Eye… absolutely stunning! Lovely work Craig and great post production. Are you still shooting with the D700 ? Such awesome photographs of a beautiful couple. You’re work is fantastic.